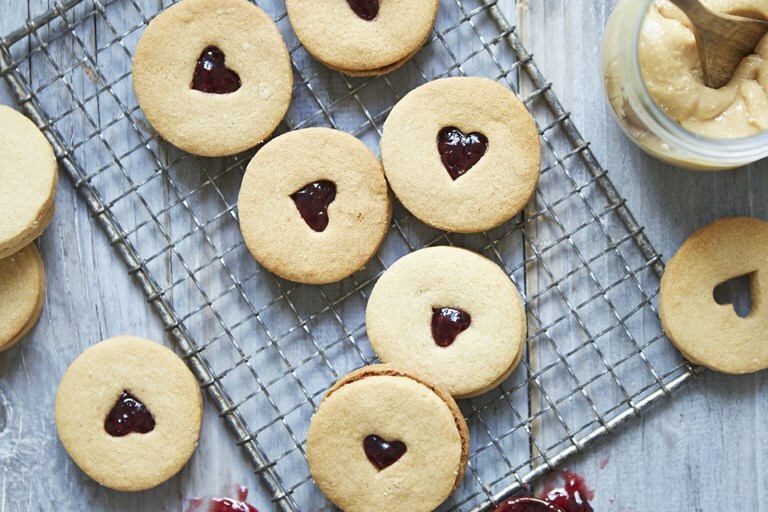 This home-made Jammie Dodger recipe has been given an American twist with the addition of peanut butter. Simple to make and gorgeous to look at, these biscuits are so much more special than their shop-bought cousins. I wrote this recipe with peanut-butter-and-jam sandwich fans in mind, giving that all-American classic a biscuity twist. Freshly baked, these biscuits are crisp in contrast with their jammy middle; left a couple of days, they become softer and more sandwich-like. Either way, they're irresistible. In a medium bowl using a wooden spoon, or in a stand mixer fitted with the paddle attachment, cream together the butter and peanut butter for 1 minute.